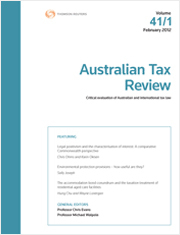 In an article published in the Australian Tax Review in 1993, it was suggested that the judicial conception of “income” in a fiscal context was moving closer to the economic concept, without necessarily clarifying it. The passage of two decades has not simplified the drawing of a distinction between income and capital gains and losses: it remains an exercise in attributing a character to primary facts. This article examines four strands of reasoning, found in decisions since 1993, which may assist in drawing the distinction – but still leave it as an exercise in judgment. Debt financing and equity financing are treated differently under Australia’s income tax system. Introduced in 2001, Australia’s debt-equity rules are an attempt to bring economic substance and principle-based law to the difficult task of characterising financial instruments for taxation purposes. This article considers the extent to which the debt-equity rules have been successful to date. In addition, this article considers the recent work of the Board of Taxation and whether two proposed reforms – to the related scheme aggregation rules; and to the “ability or willingness” caveat to the definition of a non-contingent obligation – are likely to ameliorate present difficulties, or cause additional problems. Prior to 2012, the Chinese VAT applied primarily to supplies of goods, with supplies of services, including financial services, subject to a turnover tax known as the Business Tax. The value of financial services in respect of a loan was interpreted as the gross interest payable on the loan. As a consequence, a 5% turnover tax was applied to interest payments, with no input tax recovery by business customers in the VAT system. The result was overtaxation of all borrowers and, in particular, business customers facing significant biases and distortions from the compounding tax liability. Since 2012, Chinese authorities have gradually been shifting services subject to the Business Tax into the VAT. Yet to be moved are loans and similar financial services as there is no clear agreement as to how the Business Tax rules on financial services might be integrated into the VAT. Somewhat ironically, depending on how they are migrated into the VAT and the VAT input tax system, these unprincipled and distorting rules might end up providing a model for taxing financial services in a VAT. The result has the potential to be the benchmark for reform of the VAT in the 21st century. For the PDF version of the table of contents, click here: Checkpoint – AT Rev Vol 45 No 1 Contents or here: Westlaw AU – AT Rev Vol 45 No 1 Contents.